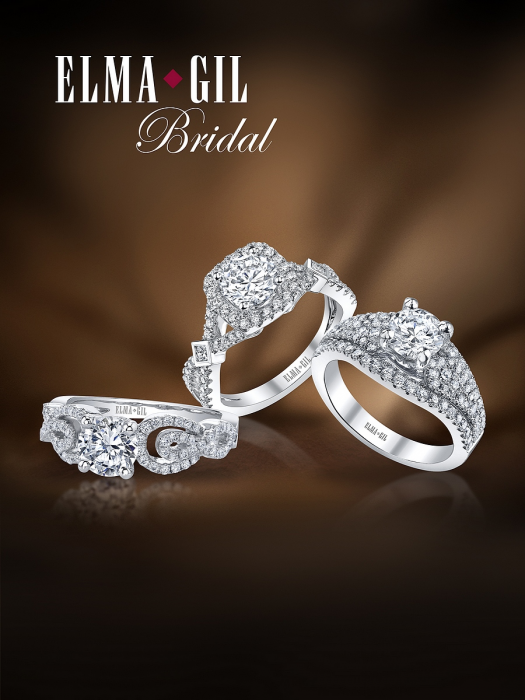 For over 23 years, Elma Gil has been in the forefront of bridal and fashion jewelry crafting. Setting fashion trends, winning design awards and producing innovative and alluring jewelry, have won them recognition the world over. Employing state-of-the-art diamond cutting, casting and setting techniques, coupled with meticulous craftsmanship and a six-stage quality control process, have earned them the reputation as one of America’s premier jewelry manufacturers. By specializing in diamonds and colored gemstones that are calibrated to 1/100th of a millimeter, cut to perfect proportions, and set in eighteen karat gold or platinum, they have mastered the art of precision. By designing contemporary, sophisticated and incredibly brilliant jewelry, they have managed to evoke the emotions in every woman’s heart. Come into our store and view a collection of great ideas from the designers at Elma Gil, and let us help you give the gift that will last a lifetime.